Middle of July already?? How? HOW? That can only mean one thing… We are more than halfway through our cake of the month adventure. How are we doing? Have you made any yet? I know last month’s cake was a big hit and I saw manyyyy beautifully swirly pictures on IG! Thank you for tagging me! Today, we’re visiting a cake that I’ve had in my back pocket for many years. I used to make this cake often for custom cake customers, and it was wildly popular in the summer months. The reason I’m bringing it to the blog today is because it showcases one of the best fruits summer has to offer: fresh strawberries. Back in the day, when I developed this recipe, I took to Google and Pinterest to find a strawberry cake that was made with actual fruit. Can you believe it? I found a lot that were made with strawberry jelly, jam, or even Jell-O, but that’s not at all what I was looking for. I wanted soft, fluffy cake dotted with actual bits of strawberries. I found strawberry cupcakes from Brown Eyed Baker that I figured I could turn into a cake, and after a few tries, I settled on this lovely little number I’m sharing with you today. The ingredients in this fabulous cake are nothing you haven’t seen already in cake. Nothing special, nothing fancy, and no artificial flavors. 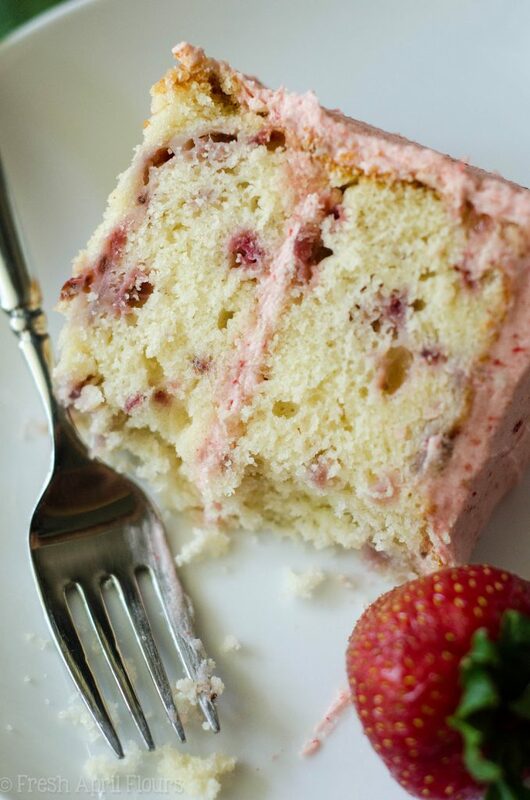 You’ll be getting 100% of the strawberry flavor in this cake from actual, juicy strawberries. 2 cups of them! That’s about 16 large strawberries. So much flavor! 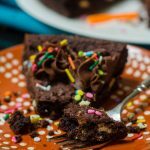 The cake itself lends to a soft and fluffy texture. You might think this cake should be dense and heavy, but it is absolutely not. It’s basically like eating a strawberry cloud. Can you dig it? 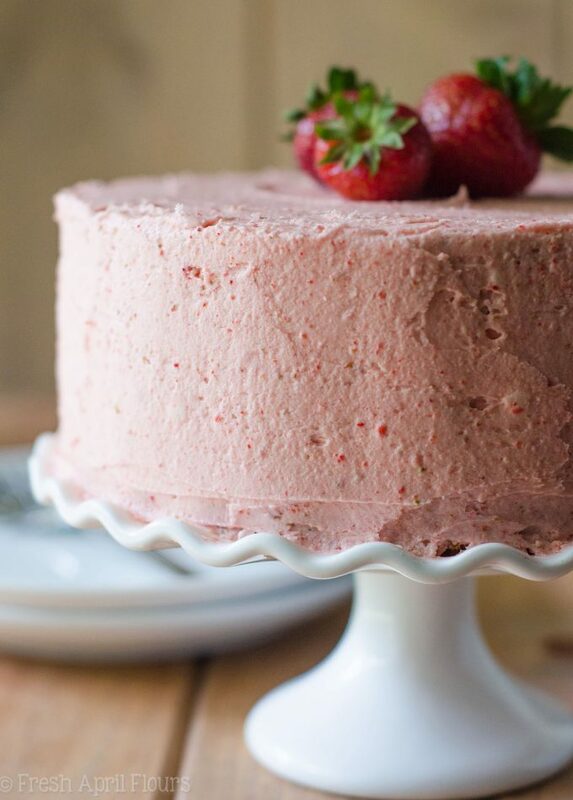 The only thing that makes this strawberry cake better is the absolutely creamy dreamy strawberry buttercream that gets slathered all over every inch of it. Ohhh, it is SO GOOD. I spent a whole lot of time trying to make strawberry buttercream in my past cake baker life, and I always failed miserably. I never got the right ratio of strawberries to sugar and butter in order to get great flavor and also avoid making a shloopy, drippy mess. Like I said, failed miserably. It wasn’t until I had a lightbulb moment and wondered if freeze-dried strawberries might do the trick. Spoiler alert: they were perfect. We can get freeze-dried strawberries in the dried fruit section of our grocery store, so if you aren’t sure yours carries them, check that section carefully! I was surprised to find them there. You’ll need to blend up approximately 1 cup of, winding up with about 1/2 cup of strawberry powder. That will go directly into your basic buttercream (the same recipe I use here) and it will lend the most wonderful strawberry flavor while also keeping the integrity of your sturdy buttercream intact. Win win, people! The second you have a taste of this strawberry cake with strawberry buttercream, you’ll wonder where this cake has been all of your summer so far. 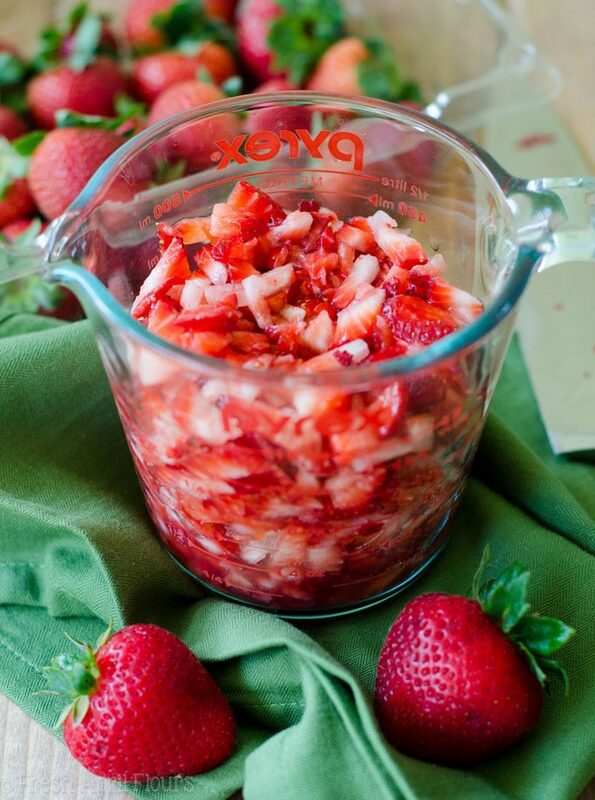 It is the perfect way to use up that beautiful produce that is just calling your name every time you’re in the grocery store, and you won’t regret the time it takes to hull and chop all those strawberries. Totally worth the work. We dined on this sweet and slightly tart cake all 4th of July weekend, and it was a huge hit everywhere it went, which was, surprisingly, a few people’s houses. In fact (!!!! ), our son has proved not to love cake so much (I’m a little heart broken), but he couldn’t get enough of this stuff. Perhaps it was all the fruitiness, who knows, but you definitely need this cake in your life this summer. Besides, just look at those gorgeous strawberry studs and the color of that buttercream! Who can resist that? Soft and fluffy cake made with fresh strawberries and topped with a creamy strawberry buttercream. Place oven rack on the middle setting and preheat the oven to 350ºF. Grease and flour (or use Wilton's Cake Release) two 8" or 9" round cake pans. In a medium size bowl, whisk together the flour, baking powder, and salt. Set aside. In a large bowl with a handheld mixer, or the bowl of a stand mixer fitted with the paddle attachment, cream the butter, sugar, and vanilla until pale (approximately 3 minutes). Add the eggs and egg white one at a time, allowing each to incorporate before adding the next one and scraping the. Scrape down the sides of the bowl when necessary. Reduce the mixer speed to low and add the flour mixture in 2 parts, alternating with the milk. Gently fold in strawberries by hand. Divide batter evenly between the two prepared cake pans. Bake cakes for about 40-44 minutes or until a toothpick inserted in the center comes out clean and the tops are lightly browned. Remove from oven and allow cakes to cool completely on a wire rack before assembling. 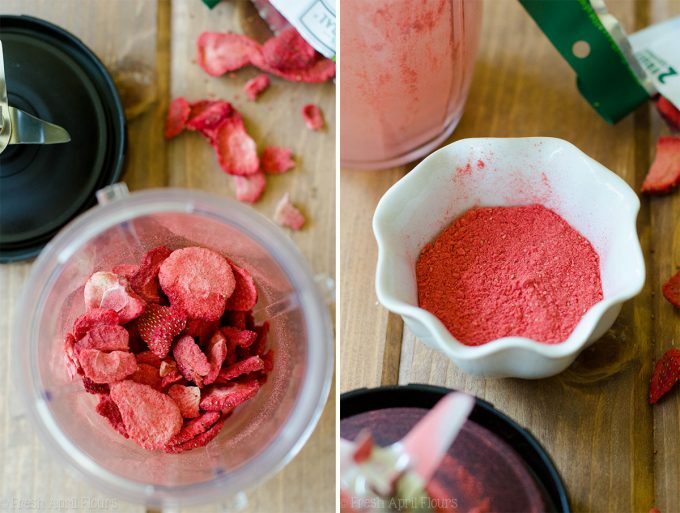 Using a blender or food processor, process the freeze-dried strawberries into a fine powder. Set aside. In a large bowl with a handheld mixer, or a stand mixer fitted with the paddle attachment, beat the butter on medium speed until creamy, about 2 minutes. With the mixer on low, add in the powdered sugar, vanilla, and milk or cream. Add the strawberry powder, increase mixer speed to medium, and beat until completely smooth, about 3 minutes. If frosting is too stiff, add more milk. If it is too thin, add more powdered sugar. Add salt to taste. Trim cooled cake layers to create a flat surface. You can do this with a large serrated knife or a cake leveler. Place one layer on a plate or cake stand and cover the top with strawberry buttercream frosting. Spread evenly with an offset spatula. Place second layer on top, cut surface down. For a sturdier cake, refrigerate at this point for about 10 minutes. When cake is slightly chilled, remove from refrigerator and spread more frosting on the top and around the sides. Serve. Leftovers stay fresh, covered tightly, at room temperature up to 5 days and in the refrigerator up to 1 week. Make ahead: prepare cakes and frosting up to 1 day in advance. Cover cakes tightly and keep at room temperature or in the refrigerator until ready to assemble. Refrigerate prepared frosting in an airtight container until ready to use. Unfrosted cake layers may be frozen, wrapped tightly, up to 2 months. Thaw overnight in the refrigerator before assembling. Frosted cake can be frozen, wrapped tightly, up to 2 months. Thaw overnight in the refrigerator and bring to room temperature before serving. 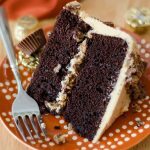 I love this cake of the month series! I wish I had more opportunities to make layer cakes. Next time I make one, it will have to be strawberry. I love that you used fresh and freeze dried strawberries! I have been trying to figure our what to make for my birthday cake next month (yes I am one of those people). I think this might be at the top of the list, I love all the real strawberries in the batter and that buttercream, OMG! The cake looks perfect and fluffy. Thanks for posting your beloved recipe and I will report back if I make it. Oh, one more thing, what is the bake time on this? I think it was supposed to be step 3 but it is not there. Hi Courtney! SO sorry, that was a complete oversight on my part. I didn’t even type out the recipe– I just left my shorthand notes in there! It’s now fixed and all the pertinent information is there 🙂 thanks for pointing that out for me! YES for REAL strawberries! Girl, this looks incredible. And SO SMART to use freeze dried strawberries for the buttercream. 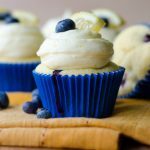 I’ve always had a ton of trouble using juicy berries to work in a buttercream, and this is just pure genius. YUM! 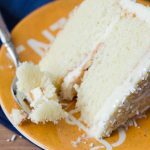 Exactly– and it’s a darn shame because fruity buttercream is AMAZEEEEBALLS!! I used an immersion blender to liquefy a couple of ripe strawberries. I added a couple of tablespoons of the liquid to the butter cream and reduced the volume of cream. It was excellent. The icing had a lovely strawberry flavour and was a gorgeous shade of pink. I made this cake for a 65th birthday party it was a big hit. Thanks for the recipe! Lynn! This is just perfect! Strawberries are everywhere in our supermarkets at the moment and they are so sweet and juicy. 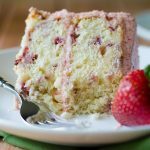 I’ve been searching for the best fresh strawberry cake for a long time, and now you’ve created it! I can’t wait to try this out ASAP to make the most of our winter strawberry haul! So beautiful! Thanks, friend! Strawberries are one of the best fruits you can put in a dessert, I think! It should say “1 cup (2 sticks),” but I just switched over to a new site/new formatting, so I’m still working through fixing the formatting issues! Could this be made into cupcakes? If so, do you have an idea how many? Hey, Ericka! Absolutely. It will make about 32 cupcakes, bake time is 25-30 minutes. Enjoy! Thank you! If I was wanting to half this recipe, what would be your flour and egg suggestion? Thanks! For flour: 1 and 1/2 cups + 2 Tablespoons, and for the eggs: I would drop down to one large egg and keep the whole large egg white. But seriously, my little girl loves strawberries (doesn’t care for chocolate) so this is her birthday cake. She is one happy 10 year old! Hahaha, well thanks, Lissa! I’m so glad you enjoyed the cake! PS my birthday was yesterday (9/26) so are your daughter and I birthday buddies? Happy birthday to her, whenever it is! Just made this and cannot wait to eat it!!! Thanks so much for the fresh recipie! I hope you enjoyed it, Stephanie! I need to make this in a 9×13 pan. Would the temp. and time be the same? Temperature would be the same, but you’ll want to decrease the baking time. I would try starting with something like 25 minutes and checking from there. Yes, they can. Try to get as much moisture out of them if you can, if you’re going to thaw them. I would probably use them frozen, but you’ll need to chop them up first. Delicious! Thank you for this from scratch Strawberry cake recipe. I made this yesterday to bring to work today for a friends birthday. Everyone loved it. I found the freeze dried strawberries at Whole Foods. I followed the recipe as written and it was perfect! So glad I found your website/blog! Cake flour isn’t always necessary in cake. Unless you’re looking for a super soft and delicate crumb, you can get away with just all purpose. 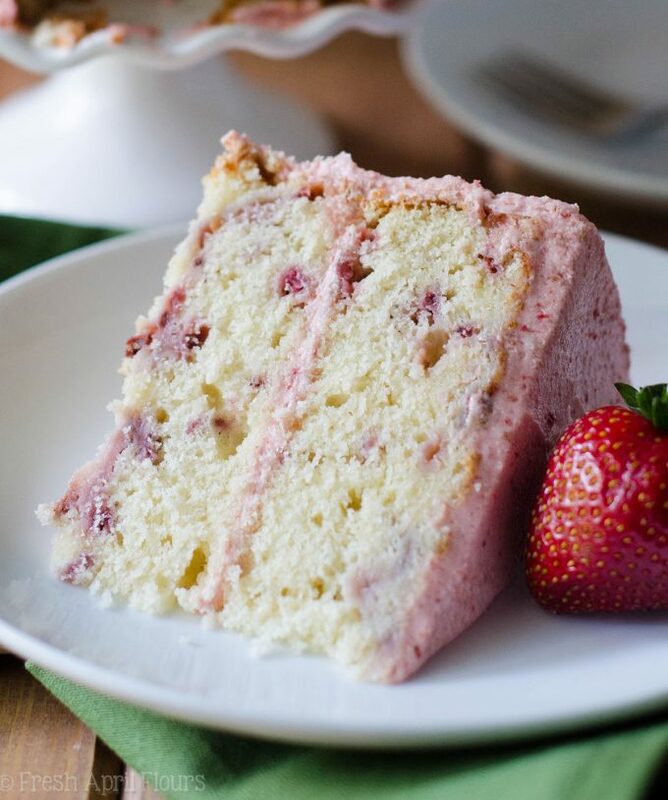 Because this cake is packed with real strawberries, we aren’t in the market for a soft crumb here. Something like my white cake (https://freshaprilflours.com/2017/03/29/white-layer-cake-with-whipped-cream-buttercream/) uses all purpose + cornstarch which is equivalent to cake flour. It looks and sounds amazing! 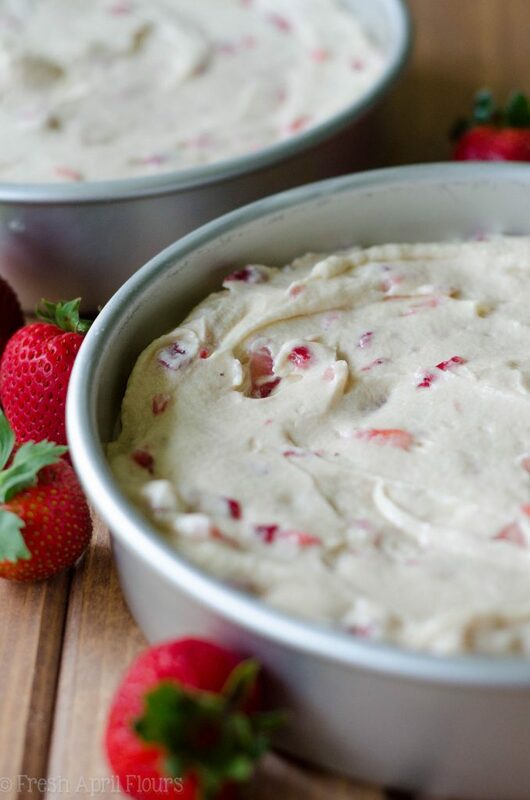 I’m just curious, could I substitute the fresh strawberries for freeze-dried in the cake batter? If so, how much? Hi, Amanda! You probably could, though I’d be concerned you’d be missing out on a mega moisture factor. If you try it, let me know! I would try about a cup. 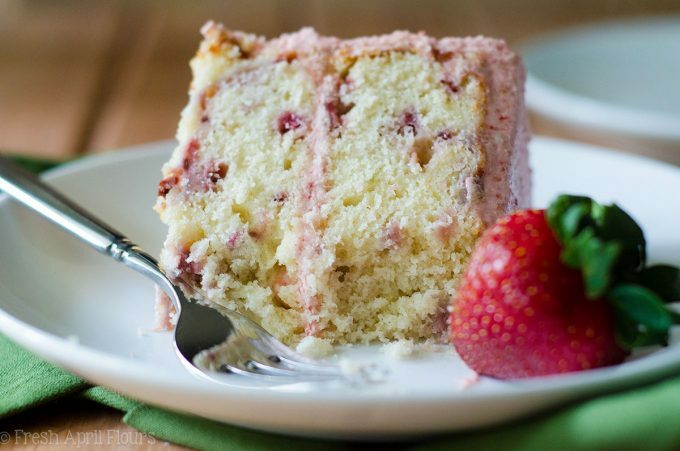 Would this strawberry cake pair well with cream cheese frosting in your opinion? My mother in law has requested a strawberry cake, but with cream cheese frosting. Thanks in advance for your help! Hi! I know this is a super late reply, but my mother in law LOVED your cake! I ended up using your cream cheese frosting recipe as well and I added the freeze dried strawberries to make it strawberry cream cheese frosting. It was amazing! I loved the cake so much that I’m making it for my birthday tomorrow! 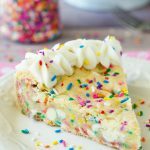 Thank you for your help and my new go to birthday cake! Hi, for the icing do I chop up the frozen strawberries or due I thaw them…I’m just a little confused on that part. Hi, Anne– you’ll be using freeze-dried strawberries for the frosting. I used frozen strawberries to make the buttercream yesterday. ~3/4 cup in a single serve blender jar on a low setting, just until they were chopped down (maybe 10-15 seconds). I used a little less than 1/4 cup milk, and I also chilled it a little before spreading it on the cake. It turned out great, and everybody loved it! So glad that worked for you, Carolyn! Thanks for sharing! Oh my goodness .. this was so good! I did one strawberry and one blueberry!!! I actually substituted 1/2 the sugar in the cake with stevia and 1/4 the icing sugar was Swerve confectioners blend! It still did Great! The strawberry was my favorite but the blueberry cake was so yummy!! Was just ok. I found it to be a little dry. I just made these for my niece’s first birthday and they came out great! I used a 1:1 gluten free flour blend, and was a little bit worried about how thick the batter was, but after they cooked with the moisture from the strawberries it was perfect. Thank you! Can you email me the fresh Strawberry Cake recipe? It looks amazing! Hi, Sue! The recipe is right there on the page. You actually have to scroll past it to comment on the blog. There’s a “print” button so you can print it right from your screen. Thanks! Tried this Strawberry cake recipe for the first time. Cake was very crumbly which made it hard to ice. Any suggestions? Hey, Marilyn. Cake is fairly crumbly on the outsides normally. I always do a crumb coat to lock in the crumbs and make it easier to ice. Unless you feel the inside was also crumbly, I don’t think anything went wrong. I made this cake for one of my customers…. and it came out absolutely perfect!!! Love the texture and the taste is spot on!! I never liked using extracts and Jello for cakes with fruits and this definitely the winner for me. Thank you so much for sharing this with us. Just made this cake for my son’s 5th birthday, and it was amazing! Everyone loved it. So moist and tasty, and such a beautiful natural color. He requested a strawberry cake, and I feel so lucky I stumbled upon your recipe when looking for one with real fruit! I doubled it and made a two-layer cake and 24 cupcakes. This warms my heart, Lea! Thanks so much for finding me and trusting my recipe. I’m so glad everyone enjoyed it. Lynn, I made this cake tonight and it was delicious! I didn’t have freeze dried strawberries, so I just used the rest of the fresh ones I chopped up for the buttercream. I squeezed as much liquid as I could out of them and it worked out just fine. This recipe is going to be saved! Thank you! Great idea, Mary! So glad you enjoyed the cake. This looks amazing. I can’t seem to see where you add the strawberries to the cake mixture in the recipe. Could you please reply and let me know. Thanks! Love this cake! Searching for a fresh strawberry cake, I chose this one and so glad I did. I did not have freeze dried strawberries so I sliced about 16 and put in my dehydrator for a few hours. Finely chopped them (not quite a cup) used 1/8 cup half and half and the icing was fantastic. Wonderful strawberry flavor! I did chill it before icing cake. Thanks for the recipe! Awesome, Paula! Thanks for sharing! I used two 8″ cake pans and it boiled over. I had to stop the baking, dump the pans half way through into a 9×13 pan to save the cake. I hope that it works out for my daughter’s birthday celebration. I’m sorry to hear that, Casey. I’ve had many readers make this with no issue, and I myself have made this cake several times in two 8″ rounds without any problems. I’m glad you found a solution. I’m so glad I found this recipe! I’m with you, I kept looking for cake and buttercream recipes made with FRESH strawberry, but all I found were recipes that relied on jam or jello. 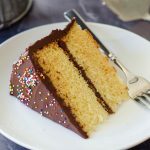 I’ve been using an adapted recipe from Martha Stewart for cupcakes for YEARS, but it is pretty dense and I wanted a lighter recipe to make a layer cake for an upcoming bridal shower. This looks just perfect! I also have to freeze the layers due to time, so thank you for including that direction! I wanted to make a 3-layer cake though – do you think I can split this recipe and bake 3 layers? Or should I double the recipe and make 4 layers? Hey, Cat! I hope you enjoy the recipe! It sounds like this is exactly what you’re looking for. If you want to make 3 layers, I suggest making 1.5x the recipe. You’ll get hung up on the eggs, so I would use 4 large eggs and 2 large egg whites. Let me know how it turns out! I came across your recipe on Pinterest and it couldn’t have been at a better time, as I am making my niece’s birthday cake for her party this weekend. It’s going to be a Care Bear themed fondant covered cake with either 2 or 4 layers. Probably just 2. But it’s a 12″ round cake. Can you help me with the ingredient amounts? I will probably just be using 2 of my 12″ pans, plus I wanted to make a few extra cupcakes. I start working on it tonight after I get home from work. Your thoughts would be greatly appreciated! Hi, Andrea! I think I might have seen this a little too late– what did you wind up doing? I would probably just have doubled it to ensure I had enough for the cake and some extra cupcakes. I actually haven’t made the cakes yet…this week hasn’t gone to plan at all so far. However I will get started in about an hour or so on them. I was actually thinking of doubling the recipe too. But when I did calculations on the amount of cups it still doesn’t seem like enough. So to play it safe I think I will make one batch at a time and fill my cake pans up until I’m satisfied and then bake them. That way I can at least make sure that they are fairly even layers. Some one post this to my FB page it looks so good I’m making one right now to take to church for our bake sale.